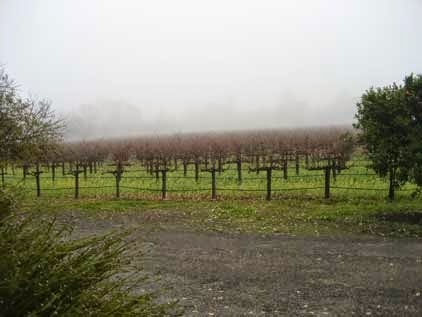 One of our favorite places is Napa Valley. Maybe in a little attempt to recapture a bit of Italy (lots of food and wine fanatics), we decided it was time to go (again). December is really a nice time to visit. The crowds are not bad, even on a weekend, and its not difficult getting into restaurants. Everything is nicely decorated for Christmas, with lots of real trees, and not overdone like most anywhere-retail-USA. Yes, the weather can be dicey, but the real rain usually doesn’t start in Northern Cal until January (and then it can be everyday). We were lucky -- it was cool, but the sun came out every day. I actually wore my cashmere sweater. We stayed in a very nice B&B, Sunny Acres, which is located at Salvestrin Winery. This was the first time, in many visits to Napa, that we found lodging that we will definitely stay at again. Its an old Victorian house, nice antiques, great breakfast, and wonderful hosts. We met up with friends from Grass Valley on Friday for lunch at Redd, one of the trendy places. It was quite good, with interesting soup and salads. For my main, I had quail (which I believe is the latest trendy meat). What can I say? It was good. For dinner we went to Cindy’s Backstreet. It’s more low key, with lots of comfort food on the menu. Roy had meatloaf, I had a duck burger. The burger was OK, but the fries that came with it were really, really good. So good, they make you wonder why you eat the typical frozen things. For lunch on Saturday, we stopped at Greystone. We have been there many times; it’s the restaurant at the CIA (Culinary Institute of American). We both had excellent soups, Roy had butternut soup, they gave us the recipe (starts with 12 pounds of squash, ends with a gallon of cream). I had a quite wonderful ciopino (fish soup). They took my email address, and hoping they send the recipe for this too! My only complaint was the wine list (irony alert - restaurant owned by Wine Spectator); it seemed overpriced for the valley, and the wines by the glass were not too exciting. For dinner on Saturday night, we had originally planned to go to Martini House (high-end tasting menu over top kind of place), but since we both had colds, decided to go for something simple, and had sushi at Go Fish (which is owned by the same Cindy as Cindy’s Backstreet). It was good, and nice that it was walking distance to the B&B. And they had really cool Christmas decorations – silver snowflakes hanging from the ceiling, and pots of narcissus and paperwhites in the windows around the room. For wineries, we of course visited Salvestrin, as well as Robert Bialli (they just do Zin’s, and buy some of their grapes from Salvestrin), and one other (ok, I can't remember how to spell it, but we will be getting some wine shipped). Plus, we stopped at Trefethen Winery, which is the first winery we visited 15 years ago in December the first time we went to Napa… and got hooked.